At last my hubby said it openly that I am addicted to blogging. Well… I am guilty of the fact that I am shamelessly, completely addicted to blogging. For every half an hour I check my blog for comments and in between I am busy with checking other blogs. From now onwards I am planning to leave my laptop upstairs. It’s not because I want to stay away from my blog. It’s just because it will help me getting some exercise of running up and down. (I can see my hubby nodding in agreement now). Before blogging came to picture, first thing in the morning I used to get up and have my breakfast. Now all I can think of is checking my blog as soon i get up. Oh yes!!! Sometimes I do this even before I brush my teeth. Ah!!! The power of blogging. 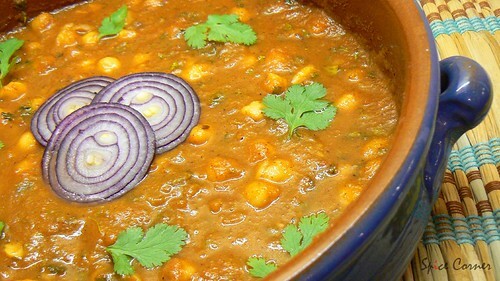 Today I am posting a recipe of Chole which I learnt from my Amma. I made Bhatures to go along with Chole. I adapted the recipe of Bhatures from Asha’s Blog. A delicious recipe from Punjab which is served for breakfast has become very much loved brunch and dinner in our house hold. This may not be the authentic way to make Chole Bhature but this is how I make it at home. 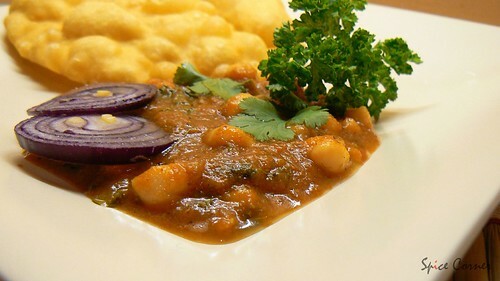 The soft and spongy Bhatures with saucy Chole is a combination made in heaven. Drain and wash well and cook it in pressure cooker with enough water for about 15 minutes. In a mean while, grind onion, ginger, and garlic along with cardamom, cloves and cinnamon without adding any water. Score a cross with a sharp knife in the base of each tomato and place them in boiling water and leave for 2 -3 minutes. Drain and allow them to cool. Then peel the skin and make a puree in food processor and keep it aside. Heat ghee or oil in a frying pan and add cumin seeds to it. When it splutters add the ground masala paste and fry in medium flame till ghee separates from it. Add garam masala, kitchen king masala and channa masala and sauté it for a minute. Now mix tomato puree and keep stirring constantly until the moisture is completely absorbed. Add salt, amchur powder, sugar and cooked channa with its water and cook till gravy turns thick. Remove from fire and garish with chopped coriander leaves and serve hot with bhaturas or puries accompanied with finely chopped onions and lemon pieces. Mix all the ingredients above and knead well using enough water to make soft dough. Cover it with wet cloth and keep it in a warm place for 2-4 hours. Make a lemon sized ball and roll them out to chapatti sized circles with ¼ cm thickness. Heat oil in a deep frying pan and fry bhaturas till they turn slightly golden and place them on paper towel. Make sure that you don’t fry the bhatures long because you want them to be soft and light golden. Serve them with Chole and vegetable salad and relish. Also Tried Trupti's and Lera's Chole recipe. Both the recipes are the keepers. SLURP!!!!!! That looks super delicious!!!!! Chole looks fabulous.If it's your mom's,it must be great.I love kitchen King masala which I found while I was in England! I will try your way next time. Enjoy,you know,somebody should round up all these mom's recipes for Mother's day on May 13th as a tribute.Can you do it? I am new to ur bog.u have great blog.look at those photos and ur way of writing its very beautiful.and chole Bhature my favourite and i will try ur version i am searching for recipie too...thank u. This is the only dish my MIL eats in any restaurant. I've been making this in different ways to get the hotel taste. Rarely I get the same taste. Will try your version soon.Picture looks YUM O YUM. I love chole bhature. Looks yum ! Lovely pictures. Yes,I am also addicted to this,but my kids pulling me back..
Chole looks good,I will try ur way. dear,now I can see ur pics. HA HA HA! That was funny! I thought I was addicted till I fell v sick this week but had to go to work, couldn't face the computer any more than I had to! Chhole Bhature look good, addition of kasturi Methi is different... I made them last night too! Thats the power of blogging! Even my hubby complains that I no more cook for him, its all for blogging! Now that I made a bunch of new and different recipes from all my blogosphere buddies, he is very happy :). Chole Bhature looks delicious. Lovely pictures are so tempting. Kitchen King is all over the S* bloggers :). I always keep forgetting to put this in my grocery list, doh! Oh you are so much right about this new addiction. I am just like you said. Ditto. In the morning with all my drooping eyes and messed up hair, I come directly to the comp ...you know to do what... hee hee. Beautiful pictures and looks perfect. Haha, please tell me you're addicted to the adulation, like me! :) Can't do without it now, can you? :) Same here, but I have toned it down a bit... well sort of. I just realised I could check my mail on my mobile at very low cost, and to avoid being seen hunching over the keyboard, I check my mail on my phone before going to sleep! hee hee!! and Sia, yeh tumne kya kiya :) i am hungry and you have posted chhhole bhature.....yaar, the internet has not advanced so much that i can just hog this stuff through the screen :). he he At last you are there! i am also getting it there! The chole looks mouth watering kane!! he he he.. i knew the moment u said u wont be checking the blogrolls on weekends, it won't last for long;) and u proved it today;) he he he.... even i told the same to K and i was sitting with laptop;) but now i really want to cut this short. amma use this kitechen king masala since as long as i can remember. it gives that extra kick to any north indian cooking. i use little bit of this in pulao and other rice items. i know... i want to somehow stop this before it becomes an obsession:) it is kind of eating up all my time. a warm welcome to spice corner:) thank you for all ur kind words ramya:) i am glad to know u liked my blog. by the way, do u have ur own blog by any chance? coz i cant find ur blog url here. i made ur version of chole too and loved it. i wanted to put a link to ur recipe but i couldn't fine the post. Sia - ahhh, isn't it wonderful to get it all out in the open: admitting our addictions? for it is only is admitting that we can seek help (LOL). Yummy food. Hey, came across your blog just today.... Its lovely! Your presentation is really good and you have an amazing collection of recipes!! You know what? I still haven't brushed my teeth and I have already checked my mail, my blog, ur blog and several others:)..Yeah, blogging is kind of addictive...The other day hubby cudn't stand it and he accused me of being obsessed with my blog..This comment ofcoz broke my heart:(..But, he was right in a way..The last thing I do b4 going to sleep is blog:))I am going to follow some routine now.. Mom's recipes always turn out good dont they! lol everyone is hit by blogging virus. now we should have a note saying beware blogging is contagious. chole in your pictures looks so scrumptious. i love chole-bhatura combinattion. i craved for it the maximum when i was pregnant. Thanku for dropping by my blog. This is my first visit to your blog and wow ur food blog is awesome.Oh my God your pics show how wonderful cook u are. anyway, chole bhature look GREAT! gravy looks sooooo yummy, loved it. every hand has some alteration in the recipe, right? BTW hope u were able to view the pix second time around. Chhole bhature looks yummy! And I know what u mean about blog addiction! I used to be that way too but my daughter got me under control! :) These days I scan for updatesfrom my blogger buddy list and take a quick look and if I have time, leave a comment. BTW, I've been meaning to tell this to you for ages but keep forgetting. I don't know if it's my computer but your blog takes almost 5 mins to load! Has anyone else experienced this? that looks soooooooo good..chole bhature is one of my favorites among the north indian dishes. thanks for the recipe sia. My husband recently pleaded with me to look at and speak with him as if he was a blog, just so I could give him some more of my attention. I only think he was half jesting :-( Planet from London. Good presentation of nice dish. hey supu!! hope you are doing good. loved the look of ur pics always. Nice presentation. I had chole bhature this weekend at restaurant. this recipe never gets old!! Yep!! I did my schooling in mangalore, though I have my roots in bangalore.....So, you can say I'm a mangalorean!! :). Have blogrolled you... hope you dont mind! and about addiction, i am trying to take drastic measures to stay away from my laptop. i am not sure if others r having same prob with page upload vani. here in my office n at home it takes just few seconds to upload the page. do let me know if u have same prob everytime u click. Thats looks really cool.Will try it out this weekend for breakfast.Was wondering if u could post some mangalorean recipes.specially chicken ghassi,fish curry and pork recipes.Love the taste of mangalorean food and looking forward to see some traditional recipes.Also do u have the recipe for sannas with yeast. thank u for dropping by. do let me know how u liked it. i am sorry to dissapoint u here. i am a vegetarian so i wont be able to post any of chicken, pork or fish recipes here. do check the links for mangalorean vegetarian recipes here. check shilpa's aayi's recipe for some konkani/mangalorean non veg recipes. i guess that is one of the best konkani cuisine blog. Looks yummy. I love chole batura!!! everytime you describe something over here, i am sure it will make me smile at the end. this time also it is fun to read your post. loved reading your posts as ususl. Keep tha good work going on. a very good food blog!!! We would like to exchange Link with You. We are already linkin to Your Site. Sia Chole Bhature my regular order at restaurants in India. Looks super tasty. We are all afflicted with this Blog addiction, there is no cure for that I guess. The family gets to enjoy tasty new foods so we all win in the end right? sia, this is my third attempt. your site just hangs up on me. gorgeous gorgeous chana. will try this. Lovely looking bhatura..I love them..chole is looking too good with the onions on that..!!!! thanks for leaving the link sukanya. glad u find my posts interesting and funny pooja. i guess most of us alike when it comes to blogging;) but yup, there is limit to everything. i got same complaint from vani. i am not sure why it hangs up bee. will sort it our in weekend. Chole Bature looks lovely Supriya. U are right abt the addiction and husbands say that often. Hey Sia.. Chole looks fabulous.. should your way of making soon.. And about the power of blogging, sometimes i am well behaved and other times, i am not.. kind a confusing my hubby... so he has not started complaining ..
i am having real bad hunger pangs.....and the chole bhature just keep looking at me from the screen.....ah! want some now! new to your blog, you have a really great blog going ! Hi Sia, Truly delicious! I cannot afford to let blogging take over my already-taken-over-by-kid life. Looks like you dont have one yet:) Enjoy blogging while you can!!! i have got the solution:) dont check any blogs when u r hungry;) what say? hey, I saw this recipes picture in this site. I dont have your mail id so thought of letting you know immediately. thanks sharmi for letting me know. i have left a comment in there site to remove my picture. will wait for few days and see if they delete it. 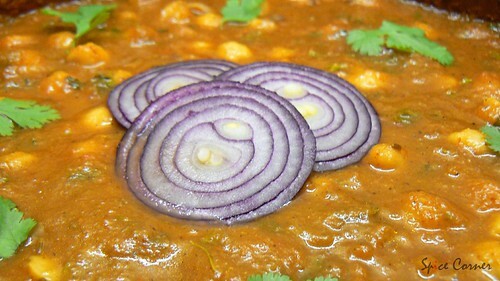 Saw your chole recipe and plan to try it tomorrow , as I am expecting some guests. 2 yrs back i too didn't know the difference between one dal to another :) so please dont hesitate to clear your doubt. are you talking abt dark brown chole? if thats the case then i would suggest you to follow my Rajma recipe. it tastes wonderful with that gravy as dark channa has thick skin and takes time to absorb flavours. the secret is to cook on very low flame for long time. if you have time then i would suggest you to cook this in the afternoon itself for dinner as it will absorb all the flavours. if you are using white kabuli channa then follow this same recipe. you can also use canned channa if you like as it will not make much difference in taste and takes less time to cook. its a wondeful feeling when someone tried ur recipe and likes it:) thanks raji for letting me know. I am totally new to your blogs and as well cooking.. Hats Off!..amzing recipes and the best part were the pics u click..
now i have developed such a addiction towards just going through urs and all others blogs all through the day and trying them here in my Kitchen..
ur dishes all look simply sooperb..chole is seriously dam tempting.. Your Picture has been used in this website. Going to try this recipe out for the Christmas pot luck. Thanks sia. Hi Sia, Hope you and your loved ones are having a happy holiday season. I decided to have a totally Indian meal for Christmas Day lunch and decided to make Chole Bhature. Made Chole using your recipe and I am in love with this dish. Absolutely mouthwateringly delicious. Definitely a keeper especially for our American friends who appreciate Indian food but cannot handle the spice. This dish is perfectly spiced with all the flavors and none of the heat. Loved it !!! For Bhature I just fried up some flour tortillas and they were a perfect substitute for Bhature. 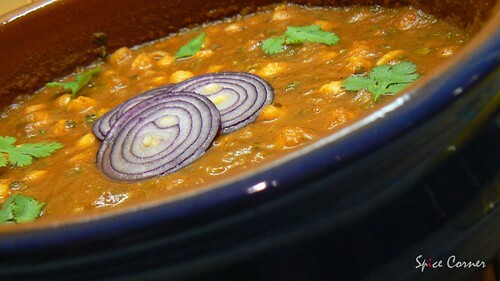 Last weekend I ws googleing for chole recipe n came across ur blog n finally evn b4 trying it I fell in luv wd it(ur blog). Also tried the recipe, evrybody at home liked it. All credit goes to you. Since then whenevr I get time I start flipping your blog pages. Both the recipe and the pics r tempting me to experiment in my kitchen asap. Thanks. Have tried your dahiwale bhindi recipes it was very delicious if followed the recipe perfectly. 3. i want to make for 8 people so i will double the recipe any other variation pls suggest? 5. if i am buying store bought tomatoes(never bought before) shall i buy tomato puree, crushed tomatoes ? wud appreciate ur reply pls.. thank you so much. Hello Akshaj, I am glad to know you enjoyed the dahi bhindi. Let me try and answer all your queries. 1. Use dry red chillies to make it spicy as it gives nice smoky flavour. Soak 3-4 (or more if you n your guests can handle the spice) dry red chillies in hot water for 2 minutes and grind them along when you prepare the onion paste. And floow the recipe. 2. Sorry that I missed it in recipe part. Add kasuri methi just before adding the tomato puree and stir for a minute. Make sure you roughly crush them with finger tips before adding. 3. Just double the recipe if youare cooking one more curry. If not you may need to use 3 cups of chana for serving guests with a very healthy appetite! 5. Buy two of 400gms canned crushed tomatoes and puree them. Adjust the amchur powder or tamarind based on how sour they are. 6. Butter is not my preferred choice for this recipe, so use just oil. 1. which garam masala should i use ( i have home made which contains coriander, cumin seeds too ) is that fine. i know the question will be silly. :) i am good in non-veg items but cooking vegeterian food is the most difficult part and getting that authentic restaurant taste.. thanks sia once again..i hope to get ur reply fast so that i can cook it for my party:)) will post the feedback soon. Homemade garam masala should work fine. Good luck :) hope i have answered to all your queries. I'll look forward to your feedback. I don't know how to express my gratitude..i am really amazed to see your detailed reply to all my point to point queries. I wonder how you do all this amazing work. I will post my feedback soon. Once again you dahi wale bhindi was too good i shared it with my friend family and they asked me the recipe i forwarded your link to them. they immediately purchased all the ingredients like amchur, kasturi (being a keralite didn't had any of these in pantry:) )..and they said it was v.good..
i tried step by step and double the recipe it turned out excellent. thanks once again sia. 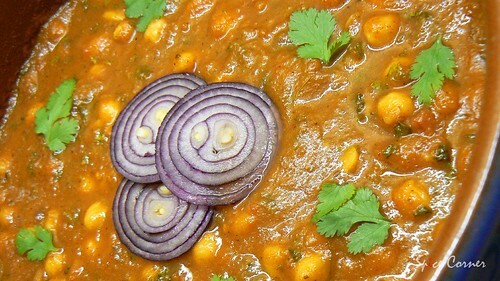 my friends loved it, who doesn't like chole they also said it is too good.